As anyone who reads this blog knows, few things tickle my fancy more than a good creature feature - preferably gory ones involving aquatic predators. In the years following Jaws, there was no shortage of the dang things, and Lewis Teague's Alligator was one of the better efforts. Written by the talented John Sayles - the scribe behind Joe Dante's 1978's cult classic Piranha, who would go on to pen and direct 1988's Eight Men Out and the critically lauded 1996 neo-noir Lone Star - Alligator is a bloody blast of wry humour, creatively depraved gore and general lunacy. It also features the invaluable Robert Forster in a self-effacing turn as a Chicago cop who spends as much time obsessing over his male pattern baldness as investigating gator attacks. In short, it's a damn entertaining B-movie, and well worth checking out. It's cheap, too! The picture also produced one heck of a great poster. Unlike the majority of the Jaws clones, which just copycatted the 1975 smash's iconic art-work, Alligator actually managed to inspire a one-sheet that stands on its own. Although it still places its toothy star front and center, this poster projects a darker, more lurid vibe than Spielberg's originator, and feels more in keeping with the exploitative horror and sci-fi movie advertizing of the era. Thus, it makes for a fantastically cool - if not quite accurate - piece of promotional art. I love the sewer tunnel-shaped framing of the central image. Given that much of picture involves Forster and his edible co-stars wandering around Chicago's bowels in search of the man-eating beastie, it's appropriate that the poster imagery depicts how the creature could appear to someone who took an unfortunate wrong turn. The artist manages to make the lurking alligator look like it almost belongs in the dank, uninhabitable environment, while still capturing it's alarming otherness. Notice, too, how the eyes are immediately drawn to the monster's frightening toothy grin. It looks less like an inhabitant of the natural world, than an unstoppable, almost supernatural, presence slowly emerging from fog and darkness. Like many of the best 80s horror one-sheets, it projects an image that is both nightmarish and exciting. It's so striking, in fact, that it even makes up for the goofy title font choice. 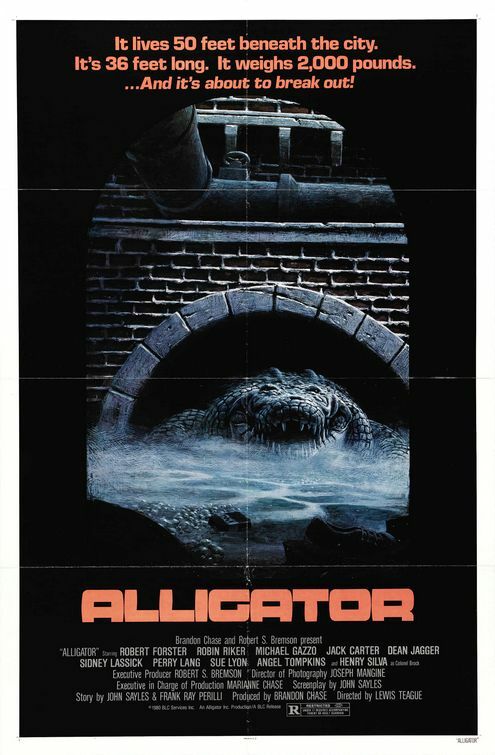 Unlike the actual movie, which is more campy and fun than scary, this Alligator poster has no shortage of bite.